View Moorabool River Basin in a larger map (opens new window). The above map is provided by Google. The department accepts no responsibility for its accuracy or content. A small water managed as a Family Fishing Lake and stocked with advanced yearling rainbow trout (See Introduction). 7.5 ha. 122 ML. Also known as Hunts Reservoir. A domestic water supply managed by Barwon Water. Wading, use of boats and fishing from structures not permitted. Surrounded by grazing land. Carries short-finned eel, redfin and some trout. A domestic water supply managed by Barwon Region Water Authority. Wading, use of boats and fishing from structures not permitted. Surrounded by farmland and pine plantations. Water level fluctuates, margins are eroded with little aquatic vegetation and the water is often turbid. Carries brown trout to 1.4 kg, redfin to 1.2 kg and abundant tench, roach, European carp, goldfish and short-finned eel. Regularly stocked with brown trout and rainbow trout. Bostok Reservoir filled rapidly after the abundant rain in 2010. As a result the reservoir was stocked with 5,000 rainbow trout in November 2010. A small creek draining into Corio Bay. The upper section dries out during summer. Contains short-finned eel, flathead gudgeon, eastern gambusia, Australian smelt, bluespot goby, European carp, common galaxias, trout galaxias, redfin, congoli and smallmouth hardyhead. Estuarine species occur in the estuary including black bream, flathead, silver trevally and snapper. Fished for European carp above the Princes Highway and for black bream in the estuary. A domestic water storage managed by Barwon Water and not open to fishing. A domestic water storage controlled by Barwon Water, servicing both Geelong and Ballarat. This is a private water with no public access. Not stocked. A small water in parkland on the Midland Highway 15 km S of Meredith. Managed as a Family Fishing Lake and stocked with advanced yearling rainbow trout (See Introduction). Flows through grazing land and is largely inaccessible due to private land. Much of the stream is not worth fishing, but there is access at Rileys Reserve, You Yangs Road Reserve at Little River, and from the weir behind Little River downstream to Rees Park; and these areas may provide some fishing. There is some riparian vegetation and the banks are stable. There is a small, self-sustaining population of brown trout averaging 140 g, but reported up to 500 g, short-finned eels to 400 g, tench to 1.4 kg and small redfin. Other fish are flathead gudgeon, eastern gambusia, trout galaxias, common galaxias and goldfish. Smallmouth hardyhead, bluespot goby and black bream have been collected from the lower estuarine section. A domestic storage surrounded by forest and managed by Central Highlands Water. Upstream from Bolwarrah, this is a small stream 1-3 m wide with quite extensive shallow pools. Has aquatic vegetation, and some algae in pools during summer. Flows through farmland and some reaches have dense willow trees and bank degradation. Other reaches have reasonable habitat. The River Health Program has seen willows removed, protective fencing on banks and extensive planting with native species. Contains some brown trout to 400 g upstream, with spawning occurring in a few suitable areas. Below Bolwarrah, the trout are larger, up to 1.3 kg, and there are also redfin to 220 g, tench, short-finned eel and river blackfish. Upstream of Lal Lal Reservoir, it is a small stream with limited access carrying some brown trout to 350 g, short-finned eel and redfin. From Lal Lal Reservoir to the junction of the East and West Branches, it flows through farmland and carries brown trout to 1 kg, redfin to 350 g, short-finned eel, tench and river blackfish. The river becomes larger downstream of the junction of the two tributaries and flows in moderate/steep hilly farmland and scattered forest. At Morrisons, the river is from 9 to 15 m wide, with extensive pools more than 300 cm deep. Substrate is rubble and sand. This is the start of the good angling water which extends down through an extensive forested area through to Sheoaks. Contains brown trout, redfin, short-finned eel, river blackfish, tench, southern pigmy perch, mountain galaxias and flathead gudgeon. There is good access at Sheoaks. Here there are extensive deep pools separated by shallow riffles with a substrate of gravel and rubble. 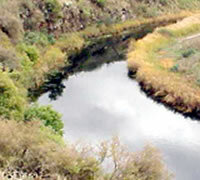 The river is in a natural condition, with forest riparian vegetation and excellent instream habitat. Sections of the river downstream of Morrisons flow through private property. Please ask permission to enter. The river flows in flat farmland, and has extensive pools to 2.5 m deep. Substrate is mud in the pools and gravel in the riffles. The same fish as upstream occur here, as well as Australian grayling, European carp and congoli. Fly-fishing, minnow lures and spinners are successful in taking brown trout. Baits such as garden worms are used for catching tench, river blackfish, redfin and short-finned eel. 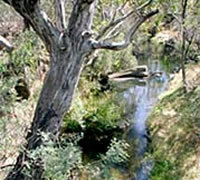 This river is considered to be one of the better brown trout fisheries close to Geelong. Two reservoirs (9,500 ML and 270 ML) situated on Stony Creek and previously managed by Barwon Region Water Authority. They are not open to the public. Management arrangements in relation to this water have changed. Now managed by Parks Victoria and the future of recreational fishing activity is under review.